If I never said thank you, I am saying it now, thank you!! While going through some pictures on a PhotoBucket account I found a picture that I thought was lost. 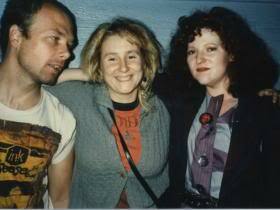 It is of Flipside Fanzine staph writers Dee (RIP) and Hilda. These punk chicks were the heart of the scene. They loved it, loved the music, and knew all the key players. They were not rude or nasty like some of the other punk women; they were friendly and part of my female initiation into an underground music scene. If I never said thank you, I’m saying it now, thank you!! Today I’m including this picture in my ongoing article about those who worked on Flipside Fanzine. We had a great time!! This song is for you!! Remember The Buzzcocks late 1970s in Los Angeles? I do too! !